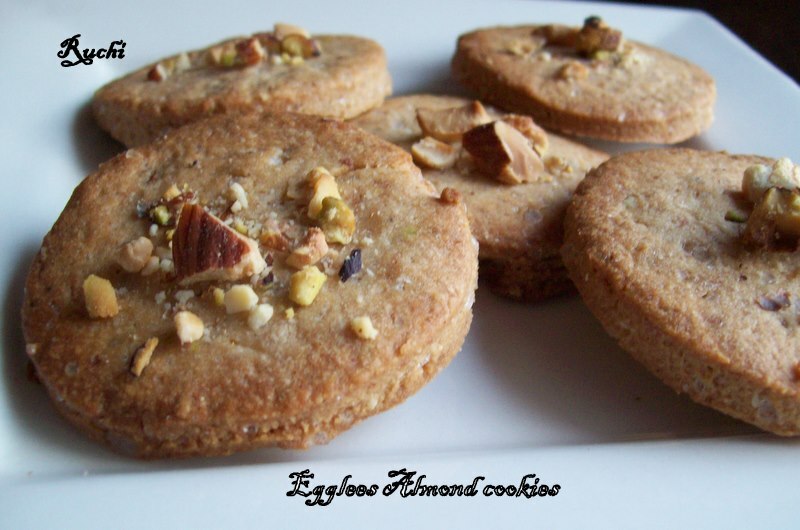 I'm looking for a eggless cookie recipe which are simple to bake eggless and comparatively healthy and can be done with easily available ingredients .I found this recipe from Manjula’s Kitchen. I made few changes of my own. Instead of sliced almonds I used Almond meal/Flour. Along with almonds I added few cashew and Pistachios too! Roast ¼ cup almonds, few cashew and Pistachios in the oven Cool and then grind with a food processor till they are fine. I`m happy to say that this was a great success, Roasted nuts and cardamom makes cookies most delicious crunchy and fragrant..
1. Pre heat the oven to 360 degree F.
2. In a bowl, mix the flour, sugar, salt, almond meal and cardamom powder well. 3. Next add soft butter and milk to the flour mixture to make dough. Dough should be very soft. 4. Divide the dough into about 24 equal parts and make them into balls. 5. Press each ball between your palms lightly; every piece should be about 1/2” in thickness. 6. Place the dough balls on an ungreased cookie sheet about inch a part, garnish with pistachio and almonds. 7. Bake the cookies for about 18 minutes or until cookies are lightly gold brown. 8. After they become lightly golden brown remove the cookie sheet from the oven. Let the cookies cool down for two to three minutes before taking them off the cookie sheet. 9.Store the cookies in the Airtight container and enjoy the goodness of the wholewheat with the aroma of the cardamom and crunchiness of the nuts. 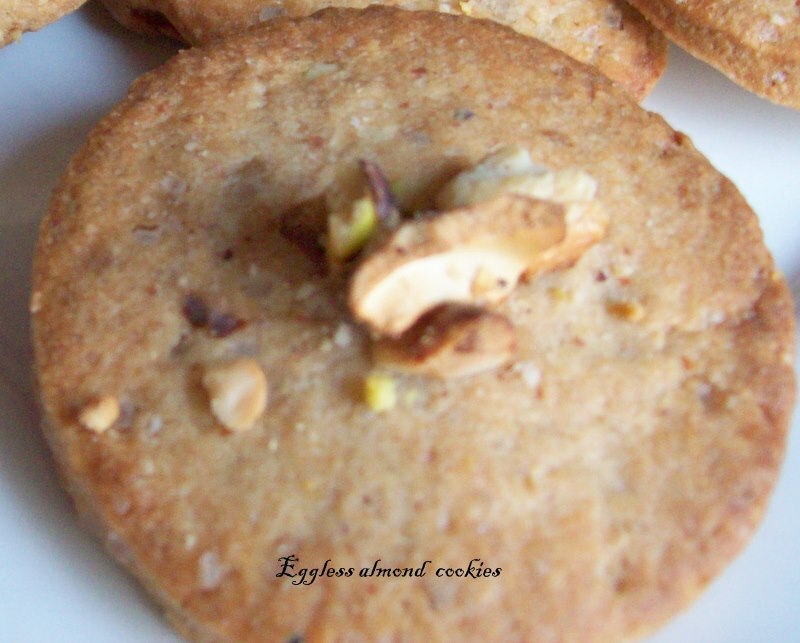 Love cardamom flavour in bakes, cookies looks fabulous Akka.. These look really healthy. I'm sure the cardamom gives them a really good taste too. Sounds and looks great,nice recipe and has come out perfect!